The scariest game I played during my early years of gaming was Resident Evil back in 1996. From the moment the Stars team entered the creepy old mansion, Wesker going missing, the dog jumping through the window, and the part in which you're locked in a room while the ceiling is slowly coming down on top of you, Resident Evil scared the crap out of me. Much like Silent Hill, Resident Evil was a stunning survival horror series that started during the Playstation era. Sadly both franchises were eventually milked beyond recognition, and no longer hold the power they once had back in the day. While the Resident Evil franchise may be dead in the water, a new franchise by the genius behind Resident Evil has arisen to the call of survival horror fans out there. For far too long have we seen countless bland titles paraded around under the guise of the survival horror genre. This latest offering delivers true horror, and delivers the kind of scares that brought me back to my nights playing Resident Evil seconds away from crapping myself. Developed by Tango Gameworks and out now on Playstation 4, Playstation 3, Xbox One, Xbox 360 and PC comes The Evil Within, the best survival horror I've played in years. Helmed by mastermind of terror Shinji Mikami, the game places you in the stoic shoes of Sebastian Castellanos, a hard-boiled detective that is pulled into a hellish world of monsters and demons. The game starts where all the best horror tales begin- a creepy mental hospital! Arriving after reports of a gruesome murder at the facility, Sebastian and his partner watch CCTV footage of officers being attacked by a mysterious figure that has the ability to move at an incredible speed. Sebastian is ambushed and knocked out shortly afterwards, and after waking up he finds that the city itself has been overrun with demonic beings, monsters and maniacs. With a loaded gun in his hand and nothing better to do on a Friday night, Sebastian must seek out the source of these demonic goings on and, if he can, stop it. Gameplay can be boiled down to being described as pure survival, but to do that you'll need to run, hide, solve puzzles, avoid traps and, of course, kill your foes. While you can often take of enemies using stealth, the game truly shines when you bring out the big guns. Whether it's a well placed pistol shot to the forehead, or a spray of a shotgun that literally obliterates an enemies face, gunplay here is robust, vicious and glorious. Weapons and abilities can be upgraded in various ways using Green Gel, a commodity that, like ammo, doesn't exactly growing on trees. When upgrading your character, choosing to either, say, increase pistol damage or extend your stamina is a decision that shouldn't be taken lightly. Upgrading your character properly is incredibly vital to survival here, so use that Green Gel wisely! The Evil Within is a game that gets back to basics about what makes horror games truly terrifying. It doesn't hold your hand or give you tips, nor does it offer up a generic cast of bad guys to slaughter. Instead the enemies you'll go up against in The Evil Within are diverse in terms of strategy and utterly unrelenting in their pursuit of killing you. If an enemy manges to get a hold of you, you won't exactly last lost. From being stabbed to death, beheaded or even smashed to a bloody pulp, the game is incredibly violent, and the shock you'll receive from the many gruesome deaths you'll endure is something that never really wears off. 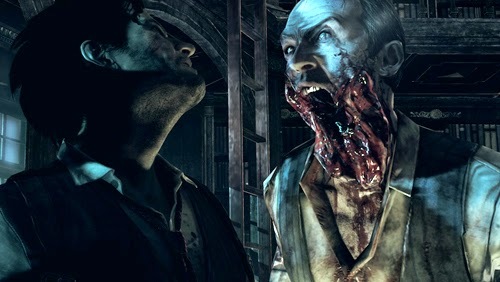 Ammo isn't plentiful here either, as while in most games you always end up with too much ammo, The Evil Within forces you to heavily conserve it. This inherently pushes the player away from the randomly-shoot-everything approach, and more down the path of taking your time, solely aiming for head-shots and generally always thinking ahead. The game isn't as punishing to the player as Dark Souls was, but just expect to be killed quite a bit throughout your time playing it. In terms of visuals, The Evil Within is literally perfect. From the detailed Gothic locations you'll find yourself sheepishly creeping around, to the bloody, shocking and nightmare fuel designs of the enemies you'll encounter, it looks like a blend of Resident Evil 4 and Silent Hill 2. It's twisted, unique and unleashes a hellish world that, despite how grim it looks, is hard not to adore. This wonderful aesthetic is all topped off by a soundtrack by Masafumi Takada that induces an extra layer of uneasiness and tension throughout the game. From tracks that are heavy, hard and almost torture your ears, to ones that are bitter sweet and beautiful, The Evil Within has it all. Overall I came away from The Evil Within with a new found love for the survival horror genre. Resident Evil and Silent Hill may have been the big dogs back in the day, but with their first game Tango Gameworks have just made their lasting mark on the genre. While it's not cerebral like a modern classic such as Amnesia: The Dark Descent, it's the Texas Chainsaw Massacre of gaming- up close and personal, unrelenting, loud and utterly horrific. The Evil Within takes the survival horror crown with 5/5.